Saturday April 23rd 1892 It was a fine day. I done baking and a little more cleaning this morning and went to town in the afternoon to attend the "Kirmiss" that the children take part in. I was busy with the evening work after I came back. Father & Mother got back tonight. Sunday April 24th 1892 I was busy about the work most of the forenoon very soon after dinner Will and I went over to Woolfs a little while. Father & Mother went calling over to Holsons. I had one of my stomach spells tonight and went to bed early. Monday April 25th 1892 I did a little sewing this morning and helped with the usual work. After dinner Mother, Sadie and I went out and fixed the hen house and set about a dozen hens. I went over town late in the afternoon and did not come home till bed time. Sally McBirde is visiting Fanny. Charlie is 66 today. 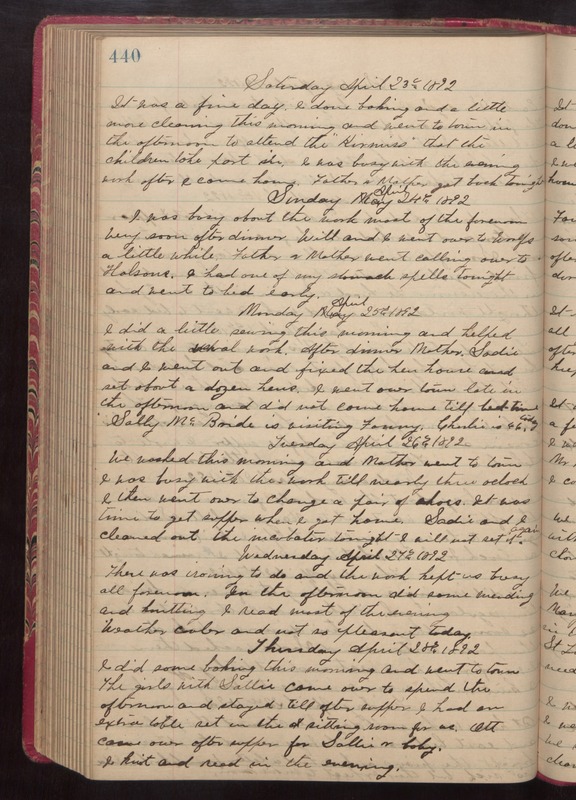 Tuesday April 26th 1892 We washed this morning and Mother went to town. I was busy with the work till nearly three oclock. I then went over to change a pair of shoes. It was time to get supper when I got home. Sadie and I cleaned out the incubator tonight. I will not set it again. Wednesday April 27th 1892 There was ironing to do and the work kept us busy all forenoon. In the afternoon did some mending and knitting. I read most of the evening. weather cooler and not so pleasant today. Thursday April 28th 1892 I did some baking this morning and went to town. The girls with Sallie came over to spend the afternoon and stayed till after supper. I had an extra table set in the sitting room for us. Ott came over after supper for Sallie & baby. I knit and read in the evening.